An adventurer's delight, We offers a outdoor activities; Camel Safari Tours-Enjoy the great journeys that Samar Magic Tours has to offer. These Bactrian Camel Safari Tours take you through the great Gobi desert, exploring one of the most remarkable and untouched parts of the planet. Explore the ice gorge, sand dunes, and site of dinosaur fossil finds as we ride our camels (two-humped) through the Gobi desert. 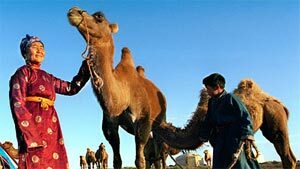 Why not try Mongolia camel trekking? The camels are Bactrian and have two humps. The Gobi is the perfect place to experience all the fun of camels which are surprisingly more comfortable than horse riding as they walk slowly and gently, and we will be well supported by the humps, sitting comfortably between them. The best time to visit the Gobi is June or September. Beautiful scenery and exhilarating riding – a wonderful combination! This region is famous for its unique natural formations, many places where you can dig and find real dinosaur fossils, flora and fauna not found anywhere else in the world. Ride the two humped Bactrian camels and discover the Mysterouis Gobi Mongolia! 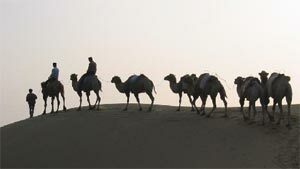 This camel riding trekkers will visit the most spectacular places and ride camels along the Golden sand dunes of the desert. There is plenty to see and photograph. Hospitable local families in Gobi Desert, who live in this fascinating part of Mongolia, also welcome you. With veteran Mongolia explorer and Trip Leader Roger Williams, explore the stunning landscape of the Gobi Desert on a 4-day camel trek across a remote and beautiful section of the Gobi that includes the Hongoryn Els, the Gobi’s largest sand dunes. For four days, we ride (or hike along beside) magnificent Bactrian camels, native to this part of the world and of great importance to Mongolia’s desert nomads as they supply precious wool, dairy products, and meat while also serving as a mode of transportation for nomad families. We conclude our Mongolian desert expedition with a visit to the Flaming Cliffs where in 1922 explorer Roy Chapman Andrews made his spectacular finds of dinosaur fossils. Join us for a memorable adventure in the Gobi! We invites you to discover the natural and cultural wonders of Mongolia, one of the last remaining seldom-explored countries. Largely inaccessible to the Western world until only recently, Mongolia offers a rare glimpse into an ancient nomadic culture that has changed little over the centuries.